You will need to fast forward this video using the scroll bar below it to see the news story . The newly-released documents contain details of a 2002 judgement by the Parliamentary Ombudsman which led to their release, transcripts of interviews with two of the key USAF witnesses, and the MoD’s official “position statement” on the incident. Just after Christmas 1980, on two separate occasions, US airmen based at the joint base of RAF Bentwaters and RAF Woodbridge witnessed UFOs in the forest, events that have consistently been denied by the Government. Staff Sergeant Jim Penniston of 81st Security Police Squadron recalled the first of the two reported encounters in Rendlesham that have been much-debated over the last three decades. In an interview conducted in the mid 1990s. He explained that on December 26 (or 27) 1980 he was sent out to investigate a suspected crashed aircraft in the forest, but the “triangular” shaped craft he discovered was unlike anything he had ever seen. He said: “I got to within ten feet of the craft and the clearing where it sat. I estimated it to be about three metres tall and about three metres wide at the base. “No landing gear was apparent, but it seemed like she was on fixed legs. I moved a little closer. I had already taken all 36 pictures on my roll of film. I walked around the craft and finally I walked right up to the craft. “I noticed the fabric of the shell was more like a smooth, opaque black glass. The bluish lights went from black to grey to blue. I was pretty much confused at that point.“I kept trying to put this in some kind of frame of reference, trying to find some logical explanation as to what this was and what was going on. It was dead silent. No animals were even making noise any more. “On the smooth exterior shell there was writing of some kind, but I couldn’t quite distinguish it, so I moved up to it. It was three inch lettering, rather symbols that stretched for the length of two feet, maybe a little more. “I touched the symbols and I could feel the shapes as if they were inscribed or etched or engraved, like a diamond cut on glass. “It was mechanical, this ship, and seemed to be under intelligent control. At that point I backed away from the craft because the light was starting to get brighter. He claims up to 80 people witnessed the craft at some point that night, but his reports were never acknowledged and the photos he took that night “could not be developed” by the base lab. 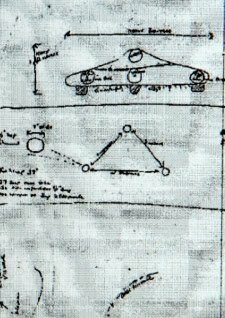 He did, however, come up with sketches of the craft. terrible! the reporting style was way off just look at the smirk on the male reporters face, the music, and the referal to it as being a myth being put across as common knowledge it's all wrong. I agree with the first comment; I'm sick of the news readers' patronising attitudes, and their complete ignorance to the idea of extraterrestrial life. If they continue to treat this topic as some sort of joke, then people will always remain close-minded when it comes to UFOs, alien life, etc.